Payment can only be made through Member’s Club Account and will be debited in advance. Refunds cannot be made for lessons. In the event of classes missed due to illness, or holiday student may attend a make-up lesson of the similar grade (by arrangement with the teacher). For lessons cancelled, all efforts will be made to offer a make-up lesson as time permits. The courses will continue providing that there are the minimum numbers of students necessary to do so. ALL class enrolment will be on first-come-first-served basis. Priority for all classes will be given to HKCC Members. Member’s Guests are welcome when accompanied by a Member. Programme rundown is subject to change. HKCC reserves the right to amend its programmes at any time. All lessons will be cancelled when Typhoon No. 8 or Black Rain Signal is hoisted. No refunds will be given. In accordance with the HKCC Club By-laws, please be aware the area outside the Club Main Entrance is a strictly "NO PARKING/NO WAITING" Zone. The Club reserves the right to with-hold acceptance of, or withdraw, any child from a programme, if a parent or nominated guardian is found to be breaching this By-Law. 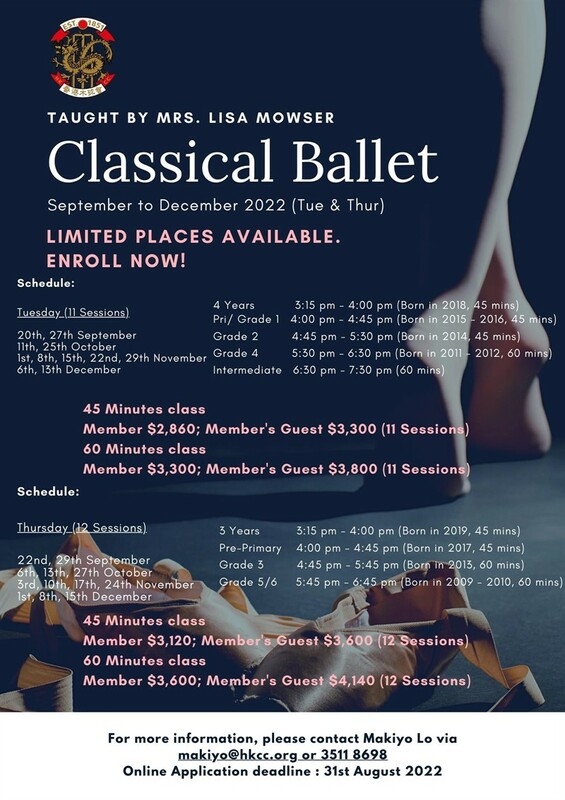 For more information, please visit www.southernschoolofdance.com.hk. I request that the participant(s) below be accepted for the Classical Ballet classes and I agree to abide by the rules and regulations as set by the Club. I will not hold HKCC or Southern Dance of School responsible for any loss, injury or damage to the participant(s), myself or my family members or property as a result of participation in these activities.